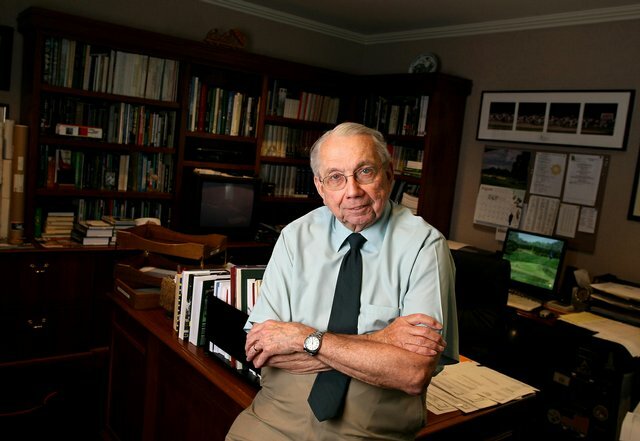 Donald W. (Doc) Giffin, the longtime personal assistant to golf legend Arnold Palmer, was chosen to receive the 2015 Memorial Golf Journalism Award. Giffin, 85, will be honored June 3 at the Memorial Tournament presented by Nationwide along with four Memorial Honorees, including six-time major champion Sir Nick Faldo. Dorothy Campbell, Jerome Travers and Walter Travis will be honored posthumously. The Memorial Tournament, founded and hosted by golfing great Jack Nicklaus, will mark its 40th playing in 2015. Hideki Matsuyama of Japan won the 2014 edition. Giffin, who began his career in newspapers and served for a time as the traveling press secretary for the tournament division of the PGA of America, the forerunner to the PGA TOUR, will be the 49th person to receive the Memorial Golf Journalism Award, which was started in 1982. Jaime Diaz of Golf World was the 2014 journalism honoree. Born Nov. 18, 1928 in Crafton, Pa., Giffin began his journalism career as sports editor of The Pitt News at the University of Pittsburgh. He later became its editor. After graduating in 1950, he was briefly employed by United Press before being drafted into the Army during the Korean War. After two years of military service, Giffin was hired at the now-defunct Pittsburgh Press, where he worked for nine years, including seven in the sports department. In 1962, he went to work as press secretary on the field staff of the PGA’s tournament division, but four years later he accepted an offer from Palmer to become his personal assistant, a job he holds to this day. Because of his long involvement in golf, the Western Pennsylvania Golf Association recognized Giffin in 1999 as one of its 100 History Makers. He also is a recipient of the Tri-State Section of the PGA of America Distinguished Service Award and was inducted into its Hall of Fame. In 2009, he received the Winnie Palmer Award of the Metropolitan Golf Writers Association and the Harold A. Stewart Award of Adams Memorial Library. The Latrobe Laurel Valley Community Chamber of Commerce recently honored him with its 2014 Community Service Award. Married since 1977 to Bernadette (Bunny) Horwat, a Latrobe native, Giffin has two stepdaughters and a granddaughter.